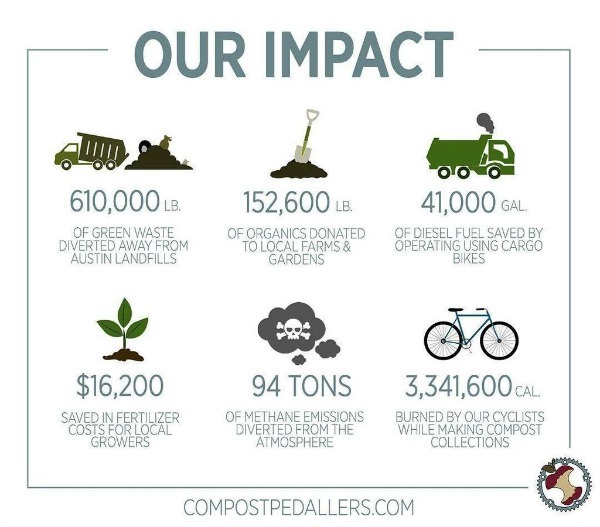 The Compost Pedallers, an eco-minded startup in Austin, TX is on a mission to lighten the city’s environmental footprint while reducing waste going into landfills. Many urban and suburban homeowners know that composting is a great way to do both. Yet not everyone is ready to take the dive into managing a backyard heap of food scraps and yard debris. Compost pedaller veteran Paul Wilson prepares to head out on his route. He loves the verbal words of support he gets from random drivers along his route. In Austin, locals can have the best of both words. 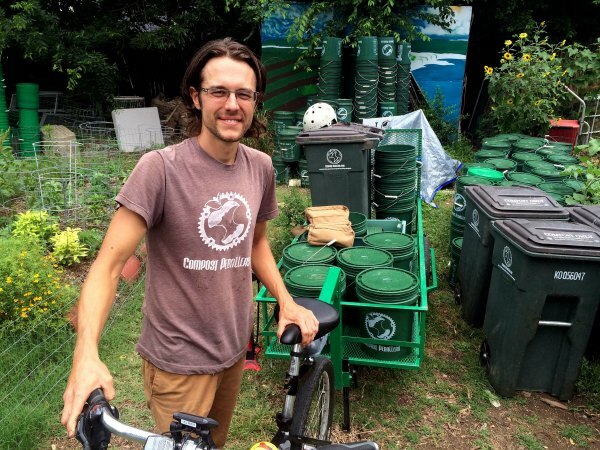 Using the clean energy of pedal power, the Compost Pedallers will bike to your door, pick up your weekly collection, and haul it off to a nearby farm to do the dirty work for you. Keeping it local and out of the landfill, while producing an abundance of compost, is a winning recipe and business model that’s as green as it gets and growing fast. Around the country, similar services are popping up, especially in urban communities. If you’d like to see if a mobile composting pickup service exists for your area, start with this online search tool for Compost Pickup Services. Or try searching online using terms such as “urban composting services”, “compost pickup services”, “mobile composting”, etc. Totally awesome! I have had the thoughts but took no action. You guys are truly making a difference and making it easy for others to be a part of the process. You deserve high praise! Just saw rerun and I’m fired up about composting! Great Episode! Great idea! Thanks, Joe. I would like to learn about the Compost Peddler. I live in Gulfport Mississippi and have a backyard garden. Need to learn about composting on a bike. joegardener.com still not working with same nastygram message. I too wanted info how to home compost. to resolve it. Thanks and happy gardening. City of Seattle has had mandatory composting for several years. Contact Seattle Public Utilities. Compost is sent to Eastern Washington farms. The Complete Guide to Composting is electrically unavailable. The following nasty-gram is displayed: “This site can’t provide a secure connection. 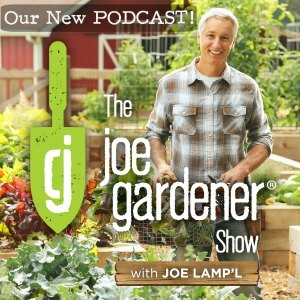 http://www.joegardener.com uses an unsupported protocol. ERR_SSL_VERSION_OR_CIPHER_MISMATCH. Would the company tech staff be willing to make the necessary updates to provide a secure connection to the web so that I could receive a copy of your guide to composting? Hi Irene. We were made aware of this problem recently and it has been fixed. Give it a try again and you should avoid that annoying message. Let me know if you still encounter problems and I’ll get it to you directly VIA email. We are sending you a copy of the compost guide to your email. Joe, firstly thank you for always bringing the world a greener world. You should know upon clicking on your complete guide to composting using google chrome the link is unsupported and doesn’t pull up. Perhaps this is a tech flaw, can you please look into it. Compost Peddlers.com kudos upon kudos, you guys Rock & Roll Soil, all your efforts will be bounced back upon you as all things are karmic. And go go Austin for all your efforts, you can teach California a bundle as I am a resident of Downtown Los Angles and will be composting NOW. Hi Immanuelle. Thanks for letting me know about this. I recently found out about this problem from another comment and it has been fixed. Give it another try and see if it works for you. If not, shoot me back a comment and I’ll get it to you directly by email. Thanks! I wish the group of dedicated pedallers all of the best! It is a wonderful idea for urban/city dwellers. Here in rural San Diego County, many people have fruit groves, primarily avocados. I have a square, 50 gallon composting container that has been out in the scorching Sun for more than 10 years now. Still produces great compost, which goes under our Granny Smith apple trees. Thank you for a wonderful show. All the best to you gardeners out there. Keep up the great work you are doing! Wow, just caught this episode and so impressed by the Compost Peddlers ideas and determination!! Every time I watch your show, I’m reminded of how many good people are out there. I love hearing happy news! I lived in Austin for one summer back in the early 80’s and boy can it get hot. Less waste for our landfills are always a great idea. Thanks for sharing. Maybe some other cities/towns will start a similar idea. Such an amazing idea! Thanks, Joe, for bringing these wonderful stories to the attention of the public. Great show. I sent a link to my niece and nephew who live in Austin.